Even though I strongly recommend NOT to do any work during your holidays, I had the pleasure of spending my holidays taking care of my 8 and 5 year old nephews, and during the time during which they allowed me to work, I basically caught up on my reading. One of the books I really enjoyed and spent a few days reading was one of the classics of ethnography: Van Maanen, John. 2011. Tales of the Field. On Writing Ethnography. 2nd. ed. Chicago and London: The University of Chicago Press. As someone who primarily does qualitative work (particularly ethnography) I am always keen to read books that are specific on research methods. This semester I am not teaching Research Methods, but I have been developing a strong syllabus specific for public policy. In pages 17-23, Van Maanen compares how sociologists and anthropologists use ethnography (these pages reminded me of a conversation my coauthor Kate Parizeau and I had over email with Carole McGranahan – ethnography IS what anthropologists do). Van Maanen historicizes the evolution of ethnography as a method and as a field itself, with an overview of the Chicago sociology School. Van Maanen differentiates how sociologists look at ethnography (somewhat as the less relevant method, whereas to anthropologists, ethnography IS the method by excellence) – I liked that Van Maanen centers on W.E.B. Dubois as an early fieldworker and key to the field itself. The book is organized as follows: Van Maanen reviews his 3 types of Tales (Realist Tales, Confessional Tales, Impressionist Tales). He then closes with a chapter on Fieldwork, Culture and Ethnography revisited, analyzing other types of tales (with brief, not extensive notes). Each chapter revisits the conventions that mark each tale. Then he uses a chapter section to describe how to produce each type of tale, often with examples from his own ethnographic writing. Then he writes about each type of tale in perspective — how each fieldworker and author operates within each Tale, etc. The Epilogue serves to bring the book together, and offers perspective on the evolution of ethnography, fieldwork, writing and reading conventions. I liked that Van Maanen takes a self-critiquing position where he says that even though he is writing a main text on ethnography, he doesn’t have all the answers. Nobody whose ethnography textbook I’ve read really does have this kind of humble approach (albeit towards the end!). 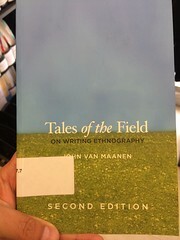 I strongly recommend the Van Maanen for anybody who does ethnography, and it is a reference text, so I would strongly encourage students and researchers to buy a copy for themselves and keep it handy. This blog post is a shorter version of my memorandum on Van Maanen, not a formal book review. I am sharing it in hopes it will be of use to those who study ethnography and qualitative methods. Tagged with ethnography, reading notes, research methods.